As the world moves towards connected societies, smaller or larger organizations engage in the latest IoT technologies, in order to seize the opportunities created in the IoT era. The constantly increasing number of connected devices and the evolution of connectivity technologies make imperative the need for a flexible IoT platform that will allow for managing and controlling this diverse and complex infrastructure. Intracom Telecom Unified IoT Orchestration platform (uiTOP) implements an horizontal IoT layer enabling management and control of Intelligent Things from different vertical domains such as Smart Lighting, Smart Parking, Waste Management and Noise Monitoring (in the context of the Smart City), Smart Home, Smart Health, Transport, Logistics, Energy and Utilities. uiTOP leverages powerful open APIs enabling the communication with a wide range of sensors and devices as well as the creation and hosting of smart applications. The offered Unified Management & Control environment provides aggregated and insightful information related to smart assets, allowing for full monitoring & control. Edge2core IoT approach from the device up to the user application layer through a future-proof platform, supporting multiple connectivity options. Smart apps creation and execution environment, allowing for new revenue streams generation. Cloud-hosted solution with multi-tenancy capabilities. Minimization of smart infrastructure operational and maintenance costs. 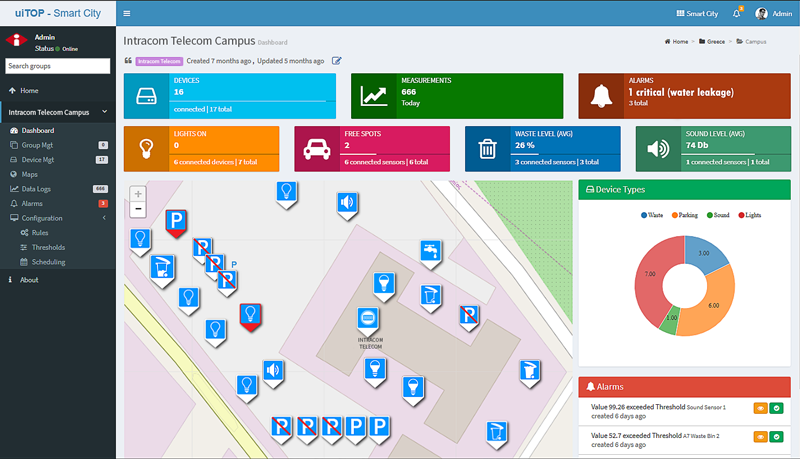 Total Command & Control environment for IoT including Smart City applications and services. Aggregated, real-time information presentation in insightful Dashboards with powerful Data Analytics capabilities. Support of customized alarms and notifications. Consolidated maps, providing a unified view of all IoT sensors/devices. Domain specific as well as cross-domain applications and smart services enablement. Modular and scalable architecture able to handle the demanding requirements of any scale IoT project. Action Scheduling and Device Grouping. Device Control for individual or group of smart devices (e.g. turn on/off/dim specific lights or a group of lights within a specific region). Maps creation, depicting the location and state of smart assets focusing mostly on Smart City infrastructure. Smart Rules creation for triggering specific actions when certain conditions are met (e.g. send an email to the Smart City operator when the sound level in a specific area overpasses a threshold). Rich set of customized Reports (Dashboards, Pies, Charts), providing a complete view of the smart assets and allowing the Service Provider (e.g. Smart City operator) to make decisions and/or take actions (e.g. plan the replacement of Smart Lighting lamps that are reaching end of life or notify the waste collector to collect garbage only from full bins). Alarms and warnings informing the operator about malfunctions and important situations requiring special attention. Integration & Data Acquisition: uiTOP offers the capability of integrating devices using different connectivity protocols, allowing for bidirectional communication between the platform and the devices/sensors and avoiding single device vendor lock. Smart device data are collected by the platform through the Interface Gateway which is used to enable communication of uiTOP with different types of sensors, devices, actuators and local gateways. Data received from the devices are stored in the platform database and they are enriched with contextual information facilitating their interpretation. Device control: Smart devices management including but not limited to device registration, device listing and device monitoring. Services and Applications: the platform uses micro-services architecture for developing services and applications hosted by the platform such as Scheduling, Group Management and Smart Rules generation. In addition, it allows the development and integration of IoT Smart City applications (e.g. Parking Management). Dashboards - Web UI: uiTOP offers a responsive and intuitive WEB UI capable of handling the large number of devices anticipated in an IoT deployment and to provide unified view and control of the devices. Real-time and batch Analytics: supports light weight real-time analytics as well as complex analysis of the received data from the sensors/devices. uiTOP comes integrated with NGINius-Charging™ for Smart City services monetization (e.g. Smart Parking). 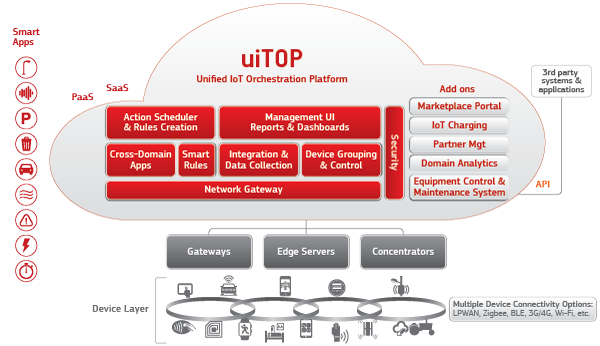 Intracom Telecom Unified IoT Orchestration Platform (uiTOP) is a horizontal platform for managing end-to-end several IoT verticals (e.g. Smart Lighting, Smart Parking, Waste Management, Sound Monitoring, Traffic Counting and Monitoring, Smart Environment). It has been designed to address the requirements for a centralized IoT and Smart City management and control. It enables communication with smart devices and actuators from different vertical domains and connectivity technologies (e.g. LPWAN, Zigbee, BT, 3G/4G, Wi-Fi).